In 1989, Smt. Girija Devi gave of live performance in Patna to celebrate 150 years of the The Times of India. This historic performance was recorded live exclusively by us and is released as part of The Golden Raaga Collection. Smt. 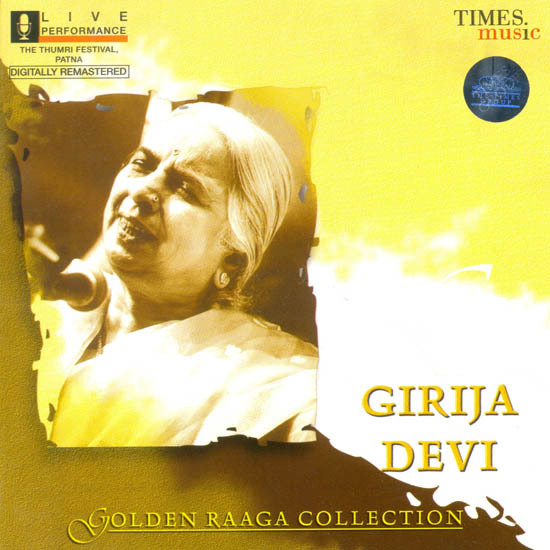 Girija Devi’s singing is a melodious blend of two Gayaki Angsseniya Gharana and the Banaras Gharana. Her music is steeped in the roots of the land. One of her greatest contributions has been to popularise the traditions of Indian classical music across the land. A grateful nation has bestowed many an award on Smt. Girija Devi. Some of these bear mentioning: Sangeet Shiromani, Padmashri and Padma Bhusan among others. 1) "Runak Jhunak Mori Bajey Payaliya"
"Humse Najariya Kahe Pheri Ho Baalam"
2) "Itni Araj Mori Maan"
4) "Chadal Cait Chit Legena Rama"